So you have bought a new underwater camera and started reading the manual – and now things have gone bad. For the uninitiated, researching underwater photography can get very confusing and sometimes, you feel you need a degree in advanced mathematics to understand what’s going on. Often, the missing component is not just what the settings do – but how they affect the pictures that you want to take. So the first thing we are going to look at are f-stops, what they are and how they affect the pictures you want to take. One of the first things you will hear photographers discuss is their f-stop settings, how they influence certain pictures they take, and what is their favourite – so what on earth is a f-stop? 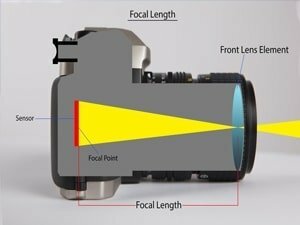 Well before we can delve in and explore f-stops, there are a couple of other terms that need to be understood, namely the focal length and aperture size. Camera lenses have a focal length. This is the distance between the sensor or film and the point in the lens at which the light rays entering the camera converge and crossover. The focal length can either be fixed or variable depending on the type of lens. A prime lens has a fixed focal length and is generally used for quite specific shots. Zoom lenses have a variable focal length; these type of lenses are most often found in compact cameras. The lens aperture is the diameter of the lens opening when you take a picture. Each lens has a series of overlapping blades that move together to adjust the size of the aperture. Generally, a narrow aperture lets in less light in a more focused, less angled beam, while a wider aperture lets in more light from a greater angle. It is very similar to the cat eye pupil, which opens wider in low light to let in more light, and narrows down to a small size in sunny conditions to reduce the amount of light entering the eye and hitting the retina. One of the key effects of altering the aperture size is the effect it has on the depth of field. The depth of field is the amount of distance that objects remain in focus for the camera. Imagine bottles arranged in a line heading away from the camera. 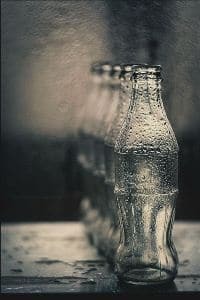 With a shallow depth of field, only the first one or two bottles would have labels that are in focus, and the further down the line you looked, the more and more it would be out of focus and blurry. With a deep depth of field setting, taking the same picture would result in the much further bottles and labels being in focus and clear, and the closer bottles having out of focus, blurry. So what on earth is a f-stop? Well to put it simply, f-stops correspond to the numerical value of dividing the focal length of the lens by the aperture of the lens. 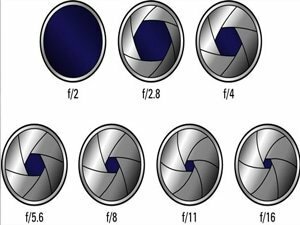 Generally, the smaller the f-stop, the larger the aperture, and the bigger the f-stop, the smaller the aperture of the lens. As a result of the change in aperture, smaller f-stops have a narrow depth of field and bigger f-stops have a longer depth of field. Using the correct established f-stop setting is crucial for you to be able to take the type of picture you want. The key to understanding f-stops all the details about it is to discuss how it affects composition. 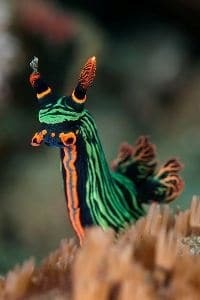 Imagine taking a picture of a colourful nudibranch on a red sponge. For this composition, you would want to use a very low f-stop (2-3.2). 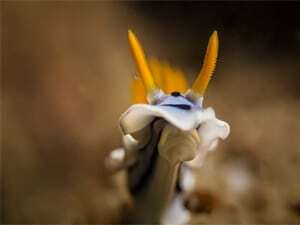 The end result of this is to produce a very sharp image of the subject (the nudibranch) or even part of the subject (the “head”), whilst the background of the sponge, which is a uniform colour, would be much softer and blurry. On the other hand, imagine taking a landscape shot of a beautiful reef with a diver in the distance – then you would want to use a high f-stop (6.3-8 or more). This will give you the depth of field required to have both the diver and the reef in focus. One thing that the photographer need to be aware of is that at higher f-stops, there tends to be some distortion at the edge of the picture and less light entering the camera. Everything else in the middle is really up to the artistic nature of the photographer. So what are the standard settings? To put it simply, there aren’t any, which is part of the beauty and flexibility of photography and also part of the frustration of mastering photography. You use the settings to get the picture that you want to take artistically, and it is up to what you want to capture. Photo journalists have a saying “f8 and be there” which indicates that being at the event is more important than minor technicalities. Additionally, there is the “sunny 16” rule, whereby most outdoor land shots in the sun should use a f16 setting as a good initial setting. What settings should I use for macro vs. wide angle? This really does depend on the type of camera you are using. Most compact cameras have a dedicated macro mode, although if you used a manual mode in macro then you would be using lower f-stops, as you would when using an SLR with a macro lens. Is there a big difference between f-stop selection on land and underwater? Yes, for general photography, you will tend to use higher stops than underwater. Underwater, you are usually much closer to the subject and there is less light penetration, which allows you to use lower f-stops than on land. 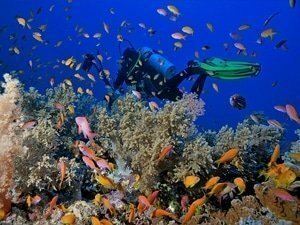 Where is the Best Diving in Thailand? Khao Lak Restaurants | Where to eat in Khao Lak? How to improve your air consumption?